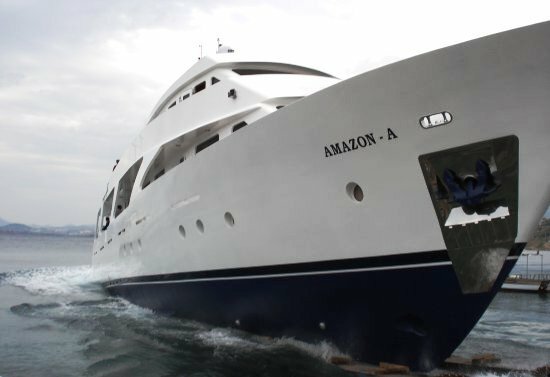 AMAZON - Photo Credit Aegean yacht services. If you have any questions about the AMAZON A information page below please contact us. The well proportioned superyacht AMAZON A is a motor yacht. 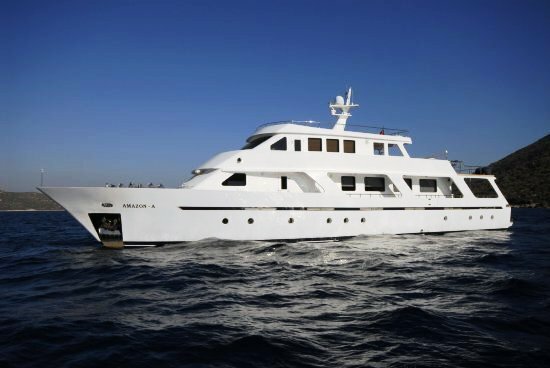 This 32 metre (105 ft) luxury yacht was produced by Aegean Yacht Services in 2006. Superyacht AMAZON A is a grand yacht that is able to sleep as many as 10 guests on board and has around 5 professional crew. 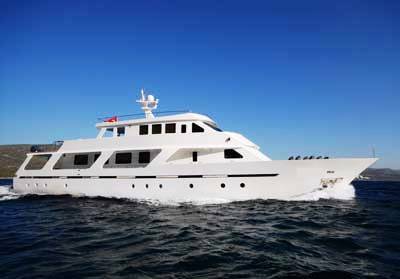 The gracious motor yacht was envisaged by naval architects Aegean Yacht. Yavuz Osman Mete was involved in the designing of the interior. The yacht's general design work came from Aegean Yacht. The professional naval architect drawings are the work of Aegean Yacht. Motor Yacht AMAZON A received her stylish interior designing from the interior design office of Yavuz Osman Mete. Built by Aegean Yacht Services this yacht was constructed in the country of Turkey. 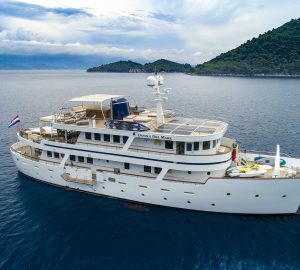 She was officially launched in Bodrum in 2006 before being delivered to the owner. A spacious proportion is achieved with a total beam (width) of 8 metres / 26 ft. With a 2.1m (6.89ft) draught (maximum depth) she is fairly shallow. The material steel was used in the building of the hull of the motor yacht. Her superstructure above deck is fashioned with the use of steel. She makes use of twin reliable CUMMINS diesel engine(s) and can manage a prudent max speed at 12 knots. The main engine of the ship gives 650 horse power (or 478 kilowatts). Her total HP is 1300 HP and her total Kilowatts are 956. AMAZON A is propelled by twin screw propellers. Having cabins for a maximum of 10 visiting passengers sleeping aboard, the AMAZON A accommodates them comfortably. The boat carries approximately 5 professional crew members to operate. The main engines are two 650 HP / 478 Kilowatts Cummins. The luxury yacht AMAZON A displayed on this page is merely informational and she is not necessarily available for yacht charter or for sale, nor is she represented or marketed in anyway by CharterWorld. This web page and the superyacht information contained herein is not contractual. All yacht specifications and informations are displayed in good faith but CharterWorld does not warrant or assume any legal liability or responsibility for the current accuracy, completeness, validity, or usefulness of any superyacht information and/or images displayed. All boat information is subject to change without prior notice and may not be current.